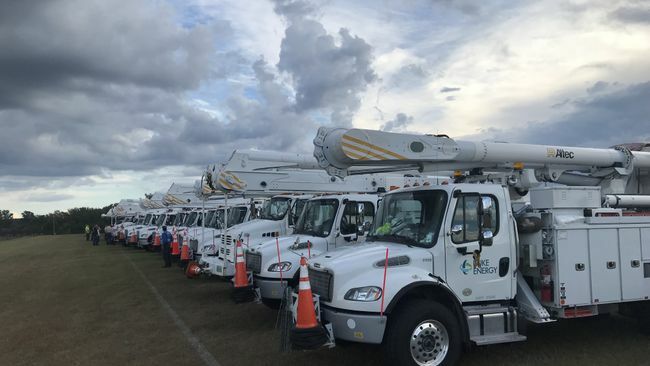 ST. PETERSBURG, Fla. – Based on Hurricane Michael’s current forecasted track, Duke Energy Florida projects 100,000 to 200,000 power outages in the northern part of its service area on the Florida Panhandle. The outage projections are based on the company’s storm modeling tool, which analyzes variables including storm magnitude, wind speed, size of the wind field and ground saturation. Duke Energy anticipates significant, widespread power outages, particularly along the coastline of the company’s service area due to storm surge. Historical data and company experience indicate complete restoration from a storm of this magnitude could take multiple days to over a week – depending on the extent of actual damage, crews’ ability to access remote areas and islands, and conditions following the storm, such as flooding. Duke Energy has mobilized more than 7,000 personnel, prepared to work around the clock to restore customers’ power. Crews from Duke Energy’s Indiana, Ohio and Kentucky operations will assist – as will workers from other utility companies based in Mississippi, Alabama, Louisiana, Illinois, Texas and Missouri. Restoring power after a storm can be extremely challenging for repair crews, as travel and work conditions can be impacted by high winds and widespread flooding – making repair work lengthy and difficult. Before power can be restored, crews first must assess the extent of damage – which can take 24 hours or more – to determine which crews, equipment and supplies are needed before repairs can begin. Duke Energy urges customers in the projected path of the storm to pay close attention to information and advice from state and local emergency management officials. Pet owners can make arrangements to stay at evacuation shelters that accept pets, friends' or family members' homes, or pet-friendly hotels. Review insurance policies, and include extra copies of the policies and other important documents in your emergency supply kit (ideally in a waterproof container). Report all power line hazards using the following phone number 800.228.8485. Calling the automated outage-reporting system at 800.228.8485.